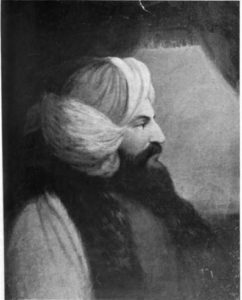 Giovanni Battista Belzoni was born in Padua in 1778, one of a barber’s fourteen children. His father intended to make the strapping lad his gift to the church; he sent him to Rome to become a monk. But when Napoleon’s army arrived in the city in 1798, Belzoni’s extraordinary size and strength marked him for forcible conscription. Uninterested in becoming a soldier for someone else’s cause, he fled Rome and took to the road. For the next several years, he and his similarly imposing brother made their way as itinerant peddlers, traveling as far as Amsterdam in search of trade goods. For more than a decade thereafter, Belzoni performed in Britain and across Europe as “Young Hercules,” “The Patagonian Samson,” or simply “The Great Belzoni.” Over six feet six inches (2 meters) tall at a time when vanishingly few men reached six feet even, he carried out his feats of strength in an elaborate Oriental costume, topped by an immense plume of white feathers. As the grand finale of his act, he would carry four or even five other men around the stage, perched on his back and shoulders and cradled in his long arms like children. Yet Belzoni was more than the hulking brute he was initially billed as. Possessed of a natural aptitude for engineering, he refined his act over time to incorporate weights driven by complicated systems of levers and pulleys, and developed a special interest in hydraulic contraptions. Belzoni came to Egypt in June of 1815. Growing tired of his life on the stage, he had invented a new kind of pump that could move a great deal of water with the assistance of just one horse or ox. Knowing how eager Muhammad Ali was to modernize the country, and seeing his invention’s obvious applicability to the problem of irrigation on the Nile, he sought an audience with the viceroy. Gaining such a thing was no easy task for an unknown man — unknown outside the world of carnival entertainment, that is — with no record in invention or engineering whatsoever. But Belzoni was nothing if not charismatic and persistent, two qualities that served him well throughout his life. He befriended Bernadino Drovetti, a French vice consul to Egypt with whom he shared an Italian heritage. The latter promised to secure him the audience he sought if he could produce a prototype of his pump to show the viceroy. Belzoni thus began struggling to piece together his design in the face of bad wood, unskilled labor, and resistant Egyptian bureaucrats who thought the old ways of moving water worked just fine. It wound up taking him almost a year to build a single prototype machine. In the midst of that time, he took a couple of days off from the labor to travel to the Giza Plateau in the company of a British traveler named William Turner. After sleeping overnight in an ancient tomb, the two ascended the Pyramid of Khufu at dawn to spend two and a half hours taking in the view. Next they toured the pyramid’s interior, in the course of which Belzoni the giant very nearly got himself permanently stuck in one of the narrower passages. He didn’t evince more than the usual touristic interest in anything he saw during this first encounter with the ruins of ancient Egypt, and he didn’t object when Turner pronounced the face of the Sphinx to be, “like those of all Egyptian antiquities, hideously ugly.” Hardly an aesthete by nature, he still had his pump on the mind. At last, the day of the demonstration before the viceroy dawned. Muhammad Ali, who loved a good show more than anything, arranged a competition in his garden between Belzoni’s new-fangled pump and six traditional Egyptian pumps; both Belzoni’s machine and each of the other six was driven by a single ox. Water poured out of the former in a torrent which all six of the latter, combined, couldn’t equal. Muhammad Ali was impressed. But then, the viceroy’s love of sport got the best of him — or, perhaps better said, got the best of Belzoni. Just for fun, Muhammad Ali suggested strapping men into the traces of Belzoni’s pump in place of an ox. About a dozen of his Egyptian lackeys duly stepped up, as did a young Irish servant who had traveled to Egypt with Belzoni. The men pulled, and water gushed forth once again. But suddenly the Egyptians, apparently unnerved by the mechanical colossus they had set in motion, jumped away, leaving the Irish boy alone in the traces. The pump, being far too much for his strength alone, began to spin in the opposite direction. He was thrown down hard, breaking a leg, as Belzoni rushed forward desperately to apply his own prodigious strength to stopping the mechanism before it crushed the youngster underneath it. Thankfully, this he succeeded in doing — but the damage to his bigger project had already been done. The pump was far too dangerous to countenance using, declared Muhammad Ali, much to the delight of his traditionalist bureaucrats. Having spent all his money on the fruitless pump project, Belzoni was now virtually penniless, and effectively stranded in Cairo. But his incredible presence would come to his rescue once again. It took some time for his admirers to realize that there was more to Belzoni than was revealed in a first impression. As his eventual biographer Colin Clair would put it long after his death, “he was always inclined to put the very worst constructions upon the acts of another if they were in some way foreign to his purpose.” Or, to put it more directly: Belzoni was a headstrong egomaniac who seldom played well with others for very long. His affectation of disinterestedness was just that. For the time being, though, Burckhardt was impressed, and recommended him highly to Henry Salt, who was newly arrived in Cairo as consul general. Salt too was immediately taken with Belzoni at their first meeting. He had need of capable men to beat the French to the choicest antiquities in the land, and Belzoni certainly seemed to qualify. Salt presented him with a challenging proposition indeed: to transport to Cairo — for eventual transport on to London — a staggeringly massive monumental bust of the pharaoh Ramses II, universally recognized as one of the most magnificent discoveries yet made in Egypt, that currently lay half-buried in the ruins of Thebes, far south of Cairo. The French had tried and failed at the task. Could Belzoni succeed? Forgetting the kindness which Bernadino Drovetti had so recently shown him, Belzoni switched his allegiance from the French to the British contingent in Egypt with alacrity. Absolutely he could succeed, he said. And he proved as good as his word. In the face of all sorts of difficulties — not least among them the interference of Drovetti, who had bribed the locals not to work for him — Belzoni’s charisma and his talent for engineering saved the day. Using improvised systems of ropes, pulleys, and levers, his workers extracted the bust from the surrounding rubble and moved it onto a large boat for transport down the Nile. In December of 1816, six months after setting out, he sailed with it into Cairo in triumph. Giovanni Belzoni as well took his place in the popular imagination as the dashing British patriot — never mind his Italian birth! — who had ventured into the desert wastes to defy the French and bring this precious ancient treasure back to London. Few men have ever been so well-equipped to play such a role. When Giovanni Caviglia arrived early in 1817 to do his important work on the Giza Plateau, Henry Salt suggested that the two enterprising Italians join forces, but Belzoni, knowing instinctively that he needed to be top dog, declined. Instead he set out southward once again: for Karnak, for Thebes, for Abu Simbel, engaging in constant intrigues with the French, surviving attempted stabbings and near drownings, opening up many a tomb that hadn’t been seen by human eyes in thousands of years, and sending all the while a steady flow of antiquities back down the Nile to the ecstatic Salt. He became, in short, the original adventurous archaeologist, the archetype for modern fictional characters like Indiana Jones. In January of 1818, Belzoni found himself back in Cairo, waiting for Salt to put together the funding for another expedition southward. To this point, he hadn’t expressed much more interest in the Giza Plateau than he had shown on his first visit there, when he was still a mere inventor trying to sell a new form of irrigation pump to Muhammad Ali. Like many others over the years, he seemed to feel that the pyramids’ very accessibility made them intrinsically less interesting than more distant sites. Now, though, excited by the recent discoveries of Caviglia inside the Pyramid of Khufu and around the Sphinx, Belzoni looked upon the Giza Plateau with fresh eyes. Eager to find places where Salt’s other Italian hadn’t been, he looked long and hard at the Pyramid of Khafre, the second biggest and, if Herodotus was to be believed, second oldest of the trio of great pyramids. “In an intelligent age like the present,” he later wrote, “one of the greatest wonders of the world stood before us, without our knowing even whether it had any cavity in the interior, or if it were only one solid mass.” Herodotus had claimed that the Pyramid of Khafre had no entrance, but time had proved the great Greek gossip monger to be a less than infallible source in any number of respects. It would be nice, at any rate, to find out for sure. Belzoni knew he wasn’t the only one thinking it was high time that the Pyramid of Khafre give up its secrets. Rumor in Cairo had it that Drovetti was close to securing permission from Muhammad Ali to blast the side of the pyramid open with gunpowder, thereby to determine once and for all — albeit at unimaginable cost to futurity — whether anything lay inside it. Examining the pyramid carefully, Belzoni thought he had a better idea. Given that the Pyramid of Khafre was so similar to that of Khufu, it stood to reason that, if there was an entrance, it might be in the same rough location: on the north face, a short distance up from the base. The other tempting possibility was the east side of the pyramid. A temple portico, partially unearthed by Caviglia the previous year, lay here, with a causeway running from it onward to a point near the Sphinx. It wasn’t hard to imagine the temple as a sort of ceremonial portal leading up to the pyramid’s entrance. The Pyramid of Khafre, Belzoni observed, was half-buried in even more sand and rubble than the Pyramid of Khufu. (This fact may explain why so many earlier observers tended to take such a dismissive view of the central pyramid of the trio; while in reality it’s only slightly smaller than the Pyramid of Khufu, the additional debris around its base likely made it appear much more so to the eye.) The accumulation was so deep, Belzoni realized, that it probably obscured the pyramid’s sides up to and beyond the height where the entrance to the larger pyramid was to be found. Given the rumors about French plans, speed was of extreme importance. Belzoni recruited one Yanni d’Athanasi, an Egyptian of Greek extraction who served as Henry Salt’s personal assistant and interpreter. Avoiding Muhammad Ali’s intrigue-riddled court, the two went to the local Egyptian administrator of the area that included the Giza Plateau, dropping Salt’s name and playing up Belzoni’s dashing reputation, asking for permission to dig at the Pyramid of Khafre. Remarkably, the official granted it without consulting anyone back in Cairo proper. The dig would have to be kept as secret as possible, thought Belzoni, for “as I knew too well how far the influence and intrigues of my opponents carried, I was not certain, that the permission I had procured might not have been countermanded, so as to put an end to all my proceedings.” He told people in Cairo that he was going to investigate some interesting ruins on Mokattam Mountain, some distance southeast of the city, and then pitched his tent on the Giza Plateau instead. Not having been terribly well remunerated for his previous adventures despite the fame they had brought him, he had only about £200 to finance the project. When that ran out, he was finished, whether he had accomplished his objective or not. Belzoni put eighty hired Egpytian workmen on the task of digging: forty on the north side of the pyramid, forty around the temple on the east side. He could afford to pay them very little, even by Egyptian standards, but tempted them with visions of the baksheesh — Arabic for “tips,” an inescapable word in Egypt then as it remains today — from the many Europeans who would flock to the Giza Plateau to visit a newly opened pyramid. It was hard going. Much of the debris on the north side appeared to be, like that which surrounded the Pyramid of Khufu, bits of the smooth casing that had once covered the pyramid, but now remained only at its very top. While circumstantial evidence indicates that the casing had been removed from this pyramid only about 150 years before Belzoni’s arrival, that was more than enough time to make things difficult. The bits of mortar still clinging to the rubble, baking in the desert sun, had bonded it into one indeterminate mass that had to be laboriously hewed apart for removal. Many a hatchet was broken in the process. It wasn’t much easier around the temple to the east of the pyramid. The base of this structure proved to lie 40 feet (12 meters) below the level of the portico which had poked above the sand. Belzoni and his workers contended with all of the problems of digging in loose sand on a windy desert plateau, just as such predecessors as Edme-François Jomard and Giovanni Caviglia had before them. The rear of the temple proved to lie 50 feet (15 meters) east of the pyramid, but a paved pathway extended toward it from that point. 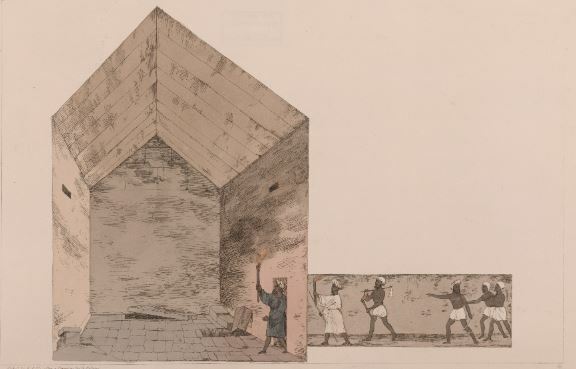 Belzoni’s workers dug their way down the pathway to find that it ended at a large square pavement which seemed to serve as the base of the pyramid, just like the one partially unearthed around the Pyramid of Khufu by Napoleon’s savants twenty years before. Belzoni noted that the Sphinx, the temple, and the Pyramid of Khafre itself gave every indication of being a planned complex, constructed on an east-to-west line and connected by causeway and pathway. But the pathway terminated only in implacable stone rather than any sort of entrance to the pyramid. Determined to keep at it until the money ran out, Belzoni moved all of his workers to the north side of the pyramid. They were now beginning to grumble that there probably was no entrance; thus there was no European baksheesh in their future, while the wages Belzoni was paying them remained sadly inadequate. Somehow he kept them at it, encouraged by what he believed to be a thinning density of casing debris as they proceeded downward. In archaeology, of course, to move downward is to move further into the past. In this case, the diggers were traveling back to a time before the casing stone had been so rudely hewn away from the Pyramid of Khafre, when the structure had stood whole and resplendent under the desert sun. On February 18, 1818 — sixteen days after excavations began — one of the workers noticed a chink between two of the stone blocks which formed the side of the pyramid. Excavating around this area, Belzoni found that one of the blocks was actually loose. The workers pried it out to reveal an aperture. Working with renewed vigor, they dug their way into the aperture. But, no matter how far they advanced, the going never got any easier; the density of rubble choking the tunnel never slackened. Four, five, six days of effort went by. Noticing that large quantities of rubble were falling down into the tunnel from above, they discovered and hollowed out a second, adjoining tunnel, which penetrated the pyramid’s surface somewhat above the other one. Much later, the tunnel split again, one path running almost horizontally, the other descending at a steeper angle. Belzoni’s workers labored to clear both. Like worms, the men burrowed ever deeper into the rock. Conditions were nearly intolerable. They worked in pitch darkness, in stifling heat, in spaces that were sometimes barely big enough to admit a man crawling on all fours — the giant Belzoni had a particularly hard time of it — with only the most primitive hand tools to peck away at the obstructions before them. Every chunk they hacked out had to then be passed hand to hand back out an aperture which steadily retreated behind them. But worse than everything else was the sense of looming disaster. As they cut their way inward, the rocks shifted in unpredictable ways. They lived in terror of a sudden collapse which could crush them — or, almost worse, cut off their retreat up the tunnel, leaving them to suffocate in the dark. One day, a large block of stone, six feet (1.8 meters) long and four feet (1.2 meters) wide, fell from directly above one of the workers. Luckily, it was stopped by other stones extending from the sides of the tunnel, doing no more than bruising his back. Still, it took some time to extract him from the stones’ embrace. That near-disaster marked a turning point. They were probably following a tunnel dug by tomb robbers of long ago, but Belzoni dared not continue. He didn’t even know whether the earlier robbers had been successful in their own endeavor to force an entrance to an interior space which might not even exist. Leaning against the side of the pyramid, a dejected Belzoni saw that which he least wished to see: an obviously European party atop the Pyramid of Khufu, waving in his direction and firing their pistols as a signal. He had little choice but to call them over. The head of the party proved to be none other than Louis Nicolas Philippe Auguste de Forbin, who had succeeded Vivant Denon as chief curator of the Louvre Museum in Paris. Belzoni reluctantly showed them around, doing his best to minimize his work, emphasizing that the tunnel his workers had partially traced, partially dug out of the pyramid was in fact a false trail. They seemed to accept at face value his story of an endeavor that had come to naught — which, as far as Belzoni knew, was exactly what his work on the Giza Plateau would prove to be. Yet the fact remained that now “all the Franks in Cairo knew what I was doing.” He must live even more in dread of the order from on high which would countermand his permission to dig here. Belzoni gave his exhausted workers the next day off. He had decided to use the day to plot one final effort to find a way inside the pyramid before the jig was up, whether due to lack of money or French interference. Observing once again the entrance to the Pyramid of Khufu, he noticed something that had somehow eluded him before. The entrance wasn’t horizontally centered, but rather offset to the east by almost 30 feet (9 meters). Yet he had been looking for an entrance — and had even found one of a sort, albeit not one that would serve — in the horizontal center of the north face of the Pyramid of Khafre. He ordered his men back to work the next day, demanding that they start clearing debris to the east of the forced aperture. This they did only grudgingly, muttering the word majnoon — “crazy” — when looking in his direction. But he was still paying them, and not at least asking them to crawl into any more dangerous spaces, and so the labor went on as the days continued to pass. 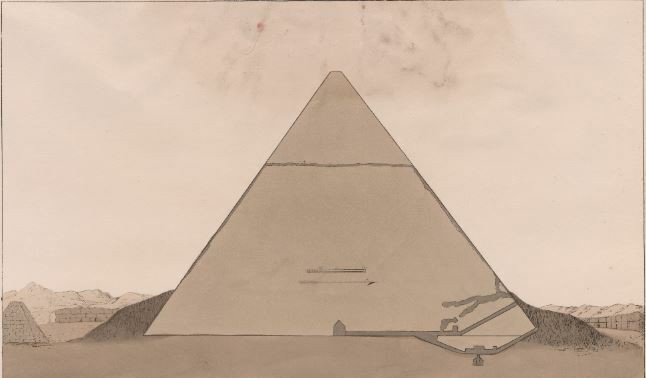 On March 1, 1818, Belzoni’s workers uncovered what had so long lain hidden beneath the desert sand: an entrance — a proper, planned entrance this time — to the Pyramid of Khafre. To be sure, it was almost filled up in places with the sand and rubble which had slid down its descending length, and it was uncomfortably cramped, being just four feet (1.2 meters) tall and three and a half feet (1 meter) wide. Yet it was a real passage, its walls clad with granite rather than being unfinished stone. Coincedentally, one of Belzoni’s countrymen, a friend named Frediani, was visiting him on the Giza Plateau on the day the real entrance was discovered. He, along with Belzoni and his Egyptian workmen and possibly Yanni d’Athanasi, were about to become the first people to enter the Pyramid of Khafre in many a long century. In comparison with the forced tunnel, clearing this one was trivial. By noon the next day, the men could walk the passage’s full extent. It ended, after 104 feet (31.6 meters), in a solid wall of granite. This “stared me in the face,” wrote Belzoni later, “and said, ‘ne plus ultra,’ putting an end to all my projects as I thought.” But then, looking more closely, he saw that the seeming wall of granite was actually suspended about 8 inches (20 centimeters) above the floor. Further inspection revealed a groove cut into the wall on either side, and a gap between the granite slab and the ceiling. He slid a long length of straw into the gap, confirming that there must be a space above “waiting to receive” the slab. What he had taken to be a wall was actually a form of portcullis! Belzoni had been incredibly lucky to discover the portcullis already slightly raised; this gave him something to lever against. But, being made of pure granite with a thickness of fully 1.25 feet (38 centimeters), it was enormously heavy. The undertaking was made still more difficult by the confined space in which the men worked: “The levers could not be very long, otherwise there was not space in the four feet height to work with them; and if they were short, I could not employ men enough to raise the portcullis.” They had to take it a few inches at a time, packing stones into the grooves in which the portcullis traveled to hold it in place each time they repositioned the levers. It was in fact one of Belzoni’s braver workmen, a man of much smaller stature than the Italian giant, who first slipped underneath the precariously suspended portcullis with a candle, becoming in the process the first man to penetrate the space beyond in centuries. “He returned saying,” wrote Belzoni, “that the place within was very fine.” The workers redoubled their efforts, and soon Belzoni was himself inside. The passage beyond was initially unchanged in size or character, although it ran horizontally rather than continuing to descend. After 23 feet (7 meters), however, it terminated in a vertical drop into darkness. Another difficult-to-demarcate crawlway appeared to run upward from just before this point, possibly marking the termination of the robbers’ tunnel Belzoni and his men had earlier followed. Of more interest to him at the moment, though, was what lay beyond the vertical drop. The walls here were of unfinished stone, thickly encrusted with niter. The passage, just under six feet (1.8 meters) high and three and a half feet (1 meter) wide, easily accommodated men of normal stature, and even Belzoni had to stoop only modestly. It ran onward, onward, for another 130 feet (40 meters). At last, the men stepped out into a large chamber. The space was 46 feet (14 meters) long, 16 feet (4.9 meters) wide, and 24 feet (7.3 meters) high at the center of its vaulted ceiling — considerably larger than the King’s Chamber inside the Pyramid of Khufu. Any hopes Belzoni might have harbored of finding an unplundered tomb were immediately dashed; the chamber was bare. Damage to the walls and floor must represent, Belzoni surmised, places where robbers of old, doubtless feeling the same disappointment he was now experiencing, had pried at the stone, looking for booty secreted away in hidden orifices. Indeed, lying amidst the damage, mute evidence of those who had broken into the chamber before, was the broken head of a hatchet. As with the King’s Chamber inside the Pyramid of Khufu, only one object remained of the place’s original contents: a granite sarcophagus — 8 feet (2.4 meters) long, 3.5 feet (1 meter) wide, and 2.25 feet (.7 meters) deep, slightly larger than that belonging to Khufu — with the lid tossed aside. A cursory look inside it revealed only loose earth and pebbles. The Master Muhammad Ahmed, stonecutter, has opened them; and the Master Othman attended this [opening]; and the King Muhammad Ali at first [i.e., was there from the beginning] to the closing up. The scholars whom Belzoni consulted in Cairo would later correlate this inscription with a passage from the Arab historian Ibn Abd al-Salam, which described the pyramid as having been opened on the orders of the king in question — who was not, of course, the Muhammad Ali of Belzoni’s own time — in AD 1372. 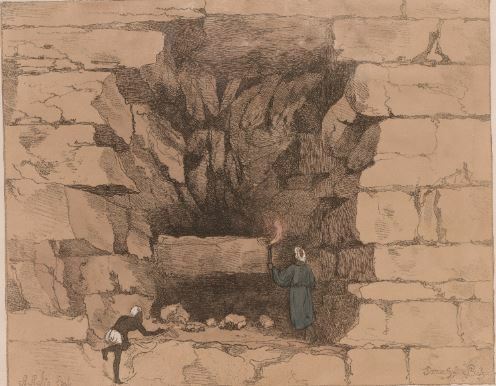 Belzoni and the rest of his party were likely the first people to enter this space since that time — but, as the bare chamber around them demonstrated all too clearly, far from its only visitors since the tomb had first been sealed. Before leaving the chamber, Belzoni carved his own signature into the rock of one wall in his native tongue: “Scoperta da [opened by] G. Belzoni. 2. Mar. 1818.” Going back as they had come, the men proceeded now along the descending passage that followed the vertical junction. It continued downward for 49 feet (15 meters), then ran horizontally for another 55 feet (16.8 meters). Opening off to the side near the end of this section was another descending passage, running 22 feet (6.7 meters) down to another vaulted chamber: 32 feet (9.5 meters) long, 9.75 feet (3 meters) wide, and 8.5 feet (2.6 meters) high. It contained only rubble, along with more impermanent scribblings on the walls, none of them immediately legible. Returning to the main passage, the men passed another portcullis, this one broken out of its grooves and lying tossed to one side; it would seem that the pyramid’s most recent visitors before Belzoni’s party had passed this way rather than utilizing the upper passage through which the latter had just entered. Ascending 48 feet (14.6 meters) beyond the broken portcullis, they found their way hopelessly blocked by a huge chunk of stone, plainly placed there for just that purpose. Yet it was equally plain that they must now be very close to a second aperture in the pyramid’s external surface, which was presumably buried beneath the rubble some distance below the entrance they had used. The stone in their way had likely been left there by the last people to enter, in 1372, as part of their “closing up” of the pyramid. It seemed that they had seen the entirety of what lay within. Now that he had accomplished his objective, etching his achievement into the stone of the pyramid itself for posterity, Belzoni felt no further need of secrecy. With the instinct of a showman, he had his workers construct a staircase at the vertical junction, thereby to make the pyramid’s interior accessible to all and sundry. Over the months that followed, seemingly all of the Europeans in Cairo, and not a few of the Egyptians, trooped through these spaces that had lain dark, silent, and closed for so long. One can only hope that Belzoni’s workmen were satisfied with the baksheesh that came their way. One of the European visitors, rummaging through the debris inside the sarcophagus with more persistence than Belzoni himself had shown, came up with a piece of bone. Further searching revealed yet more of the same. Could these be the bones of the legendary Khafre himself? There was brief excitement at the prospect, until a Glasgow anatomist pronounced the fragments to be the bones of a bull rather than a man. How they got there remains a mystery to this day. The most likely scenario may be that some guilt-wracked tomb robber of antiquity threw them into the sarcophagus as a sacrifice, in the hope of assuaging the wrath of the gods over his transgression. Belzoni had a bone to pick with Salt, and he decided to do so in public. He wrote a book about his Egyptian adventures, Narrative of the Operations and Recent Discoveries in Egypt and Nubia, which is far more engaging than its long-winded title might suggest. In it, and even more so in his conversation in London society, he described Salt as a parsimonious bureaucrat who had attained his post through patronage alone, who was jealous of Belzoni for his native talents, his courage, his fame, and his many achievements. Salt responded by calling his former protege an ungrateful mountebank, implying that much of his reputation was a fiction. It would be no great insight to say that the truth probably lies somewhere in the middle — that both men were to some extent the aggrieved and the aggriever — but that is indeed the most probable case. At any rate, Belzoni, charismatic and on the scene in London to press his case, got the better of the general consul in the British press, and Salt’s reputation has never been completely rehabilitated. Belzoni’s book proved a huge success, the most popular account of Egypt since Vivant Denon’s travelogue of almost two decades before. He followed it up by playing host to a grand exhibition of Egyptian antiquities in Piccadilly; 1900 people trooped through it on opening day alone to gawk at the mummies and shake hands with its larger-than-life master of ceremonies. But by late 1823, Belzoni’s thirst for adventure was getting the better of him once again. His feud with Salt having precluded any more expeditions in Egypt, he set off to explore sub-Saharan Africa instead. He didn’t get very far; he came down with dysentery in Benin and died within a week, at the age of 45. No trace of his grave remains today. His only enduring memorials are the inscriptions he scrawled inside the Pyramid of Khafre and at countless other sites up and down the Nile. Like Salt, Belzoni can shock our modern sensibilities with his casual attitude toward what we now recognize to be a precious part of the shared heritage of human civilization writ large. Yet he wasn’t a cretin, and his contributions to the evolving understanding of ancient Egypt were enormous. While not a trained scholar, he was a shrewd thinker, whose workaday knowledge of engineering sometimes gave him a commonsense view of things which the more scholarly types lacked. His insights about the Giza Plateau were particularly telling, not least because they evince a growing willingness to question the veracity of classical sources like Herodotus in a way that just wasn’t done during the time of John Greaves, or to some extent even that of Edme-François Jomard. Consider, for example, what he had to say about Herodotus’s claim that the stone used to build the pyramids had been transported to the Giza Plateau from some distance away. Outside of the pyramid I observed the rock surrounding it on the north and west sides to be on a level with the upper part of the [central] chamber [inside the Pyramid of Khafre]; and, as the rock is evidently cut all round, it appeared to me, that the stones taken from it must have been applied to the erection of the pyramid. Accordingly I am of the opinion, that the stones which seem to form these enormous edifices were not all taken from the east side of the Nile, as is supposed and mentioned by ancient writers. I cannot conceive why the Egyptians should be thought so simple, as to fetch stones at seven or eight miles distance, and across the Nile, when they could have them from much nearer points; indeed from the very spot where the pyramids stand. It is evident, that stones of an enormous size have been cut out of the very rocks around the pyramids; and for what purpose were these stones extracted? If any traveller will go within less than half a mile of the pyramids, particularly on the east and south sides, he may see many places, where the rock has been formerly quarried to a great length. It is true, that Herodotus says, the stones to erect the pyramids were brought from quarries on the other side of the Nile; but I firmly believe he was misinformed on this subject, unless what he asserts is to be understood of the granite alone. And as to the causeways in front of the pyramids, said to have been made to convey the stones for the erection of these masses, I believe they were intended for the accommodation of visitors, particularly at the time of high Nile; for if they were only to convey stones, the labour of making them must have been nearly equal to the erection of the pyramids. Thrills to my soul, with thoughts of what has been. 13 Comments for "Chapter 6: Khafre and the Giant"
I’m really enjoying this series on the Pyramids of Giza, Jimmy. What a fascinating story! Another enjoyable Friday read. Thanks for writing these articles! writings. Ρast seveгal posts arｅ just a little bit out oof track! Do you have any information on Belzoni’s pump design? I just spend a bit of time googling it and wasn’t able to find any information. Unfortunately, no. I wondered the same thing myself. Even Belzoni doesn’t give any details in his book. Thanks for this Jimmy, I’ve always had a soft-spot for Belzoni and his escapades. He seems to still have something of a bad reputation even though he lived and worked long before modern archaeological practices. And compared to some other 19th Century archaeologists, (I’m looking at you Champollion) he caused relatively little damage. I didn’t know Belzoni had worked out the core of the pyramids is the same local nummulitic limestone as the Giza Plateau itself. He was well ahead of his time as the majority of the quarries were by this time invisible; for instance the quarries for the Great Pyramid were filled with limestone, sand and tafla that once presumably formed the construction ramps. They were only excavated during the 20th Century. Though Herodotus was also right – the casing stones were of Tura limestone from the Eastern bank of the Nile. Presumably he thought the pyramids were made entirely of that stone. Belzoni’s 1821 exhibition at the Egyptian Hall in Piccadilly had an enormous impact on British perceptions of Ancient Egypt. The centre of his exhibition were recreations of two rooms of the tomb of Seti I (now called KV17) which Belzoni had opened in 1817. 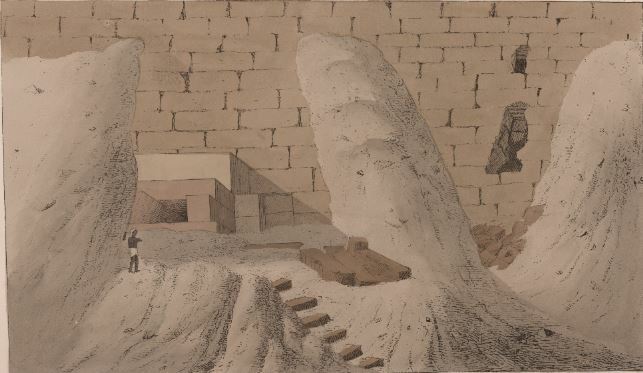 Belzoni was able to make accurate copies of the beautiful tomb using a mix of beeswax, resin and dust which was pressed on to the wall, allowed to harden and then removed, unfortunately taking some of the colour away with it. These were then used to make plaster casts which decorated an exhibition more than 200 feet long and lit by gaslight. Yes, he is a fascinating character. I could easily do another whole series on his life alone. Supposedly he dressed up as a mummy for the Piccadilly exhibition — a showman to the end. And Champollion, who was working on deciphering hieroglyphic writing at the time, wrote the catalog for the exhibition under a pseudonym when it traveled to Paris. Not sure what it was about this one, I enjoyed it even more than usual, thank you! Loving this series of articles – I had no idea how much there was to know about the uncovering of the pyramids. Keep them coming. Small correction: “bakshis” should be “bakshish”, although I’ve most often seen it transliterated as “baksheesh”, which makes the pronunciation more clear.